The deadline for filing the annual returns (for the financial year 2017-2018) in Form GSTR-9A, has been extended to the 30th of June 2019. In order to file Form GSTR-9A, candidate must ensure that they have filed all annual returns in Forms GSTR-4. The heading in FORM GSTR-9A "made during the year" with respect to supplies will be changed into "as declared in returns filed during the year". Who is required to file a GSTR-9A? When should I file my GSTR-9A? What happens if I don’t file my GSTR-9A on time? The GSTR-9A is an annual return that has to be filed by business owners who are part of the composition scheme. This return will include all the information that the composite dealers have provided in their quarterly returns during the financial year. Only business owners who fall under the composition scheme must file a GSTR-9A. The GSTR-9A must be filed at the end of each financial year. For example, if a composition dealer is required to file a GSTR-9A for the financial year 2018-2019, they must file it on or before 31st March, 2019. You would need to pay a penalty of Rs. 200 for every day after the due date, until you file the GSTR-9A. In order to file the GSTR-9A, you must fulfill the following criteria: * You must be a registered business owner who is a composition dealer. * The aggregate turnover of your business must be less than Rs.75 lakhs per annum, and less than Rs. 50 lakhs per annum if you are based in the North-Eastern states. * You must keep track of all the transactions you made during each quarter of the financial year, including all purchases and imports. Let’s take a look at different fields in the GSTR-9A and the information you need to enter. This part contains basic details such as your GSTIN number, Legal Name, and Trade Name. 1. Financial Year - Enter the financial year for which you are filing the GSTR-9A. 2. GSTIN - Enter your GST registration number. 3 A. Legal Name - Your legal name will be automatically fetched. 3 B. Trade Name - Your trade name (if any) will be automatically fetched. 4. Period of composition scheme during the year- The starting and ending dates of your enrollment under the composition scheme. 5. Aggregate Turnover of Previous Financial Year - Enter your aggregate business turnover for the previous financial year. If there are multiple taxpayers registered under the same PAN, then the total of all of the taxpayers’ turnovers must be entered here. This part contains a summary of all sales and purchases declared in the GSTR-4 quarterly returns during the financial year. 6 A. Details of taxable sales - Enter the aggregate value of all taxable sales. This includes the net value of debit notes and credit notes, advances, and goods returned for the financial year. The values entered in Table 6 and Table 7 of the GSTR-4 can be used for filling in these details. 7 A. Inward supplies received from registered persons liable to reverse charge - Enter the aggregate value of all purchases that were bought from a registered person and taxed on a reverse charge basis. You can use Table 4B, Table 5 and Table 8A of the GSTR-4 to fill in this value. 7 B. Inward supplies received from unregistered persons liable to reverse charge - Enter the aggregate value of all purchases that were received from unregistered persons and taxed on a reverse charge basis. Table 4C, Table 5 and Table 8A of the GSTR-4 can be used to fill in this value. 7 C. Import of services - Enter the aggregate value of all imported services during the financial year. You can refer to Table 4D and Table 5 of the GSTR-4 to fill in these details. 7 D. Net Tax Payable on (A), (B) and © above - Enter the total value of 7A, 7B and 7C here. 8 A. Inward supplies from registered persons (other than 7A above) - Enter the aggregate value of all taxable purchases received from registered persons, other than what is mentioned in section 7A. 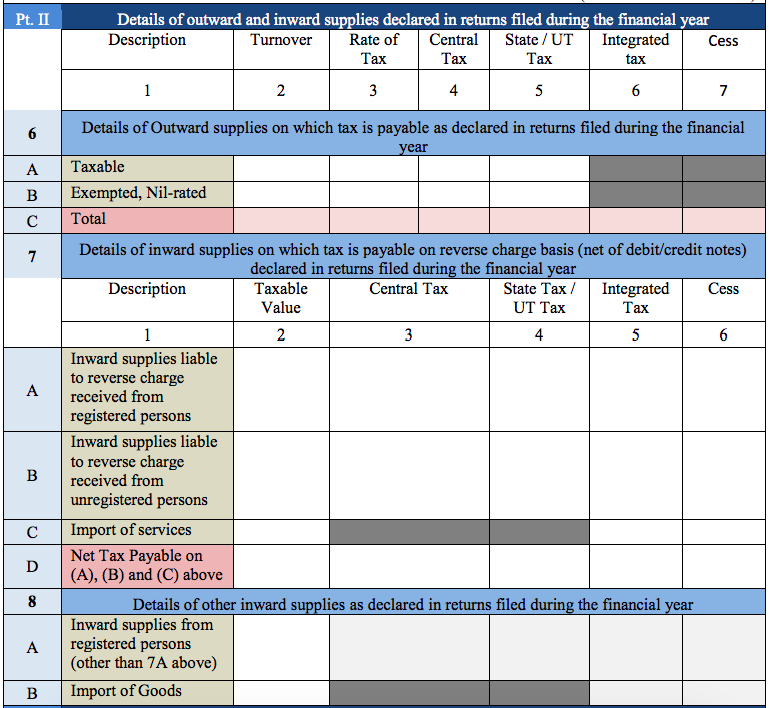 You can use Table 4A and Table 5 of the GSTR-3 to fill in these details. 8 B. Import of Goods - Enter the aggregate value of goods imported during the financial year. You can use Table 5 of the GSTR-4 to fill in these details. This part collects information about tax paid by the business. 9. 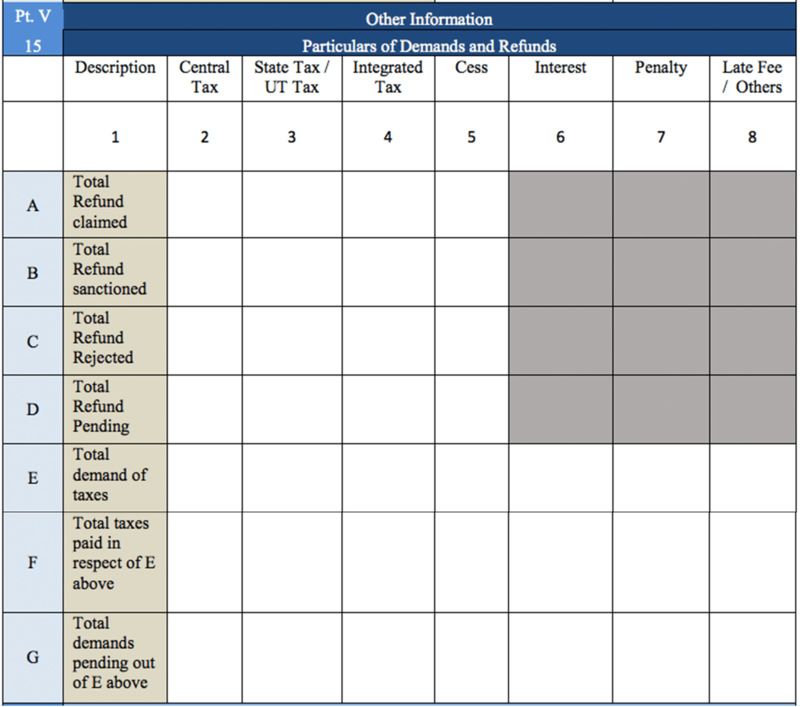 Details of tax paid as declared in returns filed during the financial year - Enter details of the tax amount due and the amount paid, as declared in returns filed during the financial year. You need to split up the tax amount according to the type of tax paid: integrated tax, central tax, state/UT tax, cess, and interest. You also need to enter values for any late fees or penalties paid in this section. Part 4 contains the details of amendments (either additions or subtractions) made to the transaction information in your previous financial year’s return. Include transactions declared in returns between April and September of the current financial year, or before you filed the previous year’s annual return, whichever is earlier. For instance, for an annual return for the 2017-2018 financial year, include transactions that took place in FY 2017-2018 and were declared in April to September 2018. Declare all of the various values of supply mentioned below and break each one down into turnover, central tax, state tax/union territory tax, integrated tax, and cess. 10. Supplies / tax (outward) declared through Amendments (+) (net of debit notes) - Enter the value of sales/tax declared through amendments made in Table 5 or Table 7 of the GSTR-4 here. This value must include the net value of debit notes. 11. Inward supplies liable to reverse charge declared through Amendments (+) (net of debit notes) - Enter the value of purchases made that are taxed on a reverse charge basis and declared through amendments made in Table 5 or Table 7 of the GSTR-4. This value must include the net value of debit notes. 12. Supplies / tax (outward) reduced through Amendments (-) (net of credit notes) - Enter the value of sales/tax that was reduced through amendments made in Table 5 or Table 7 of the GSTR-4. This value must exclude the net value of credit notes. 13. Inward supplies liable to reverse charge reduced through Amendments (-) (net of credit notes) - Enter the value of purchases that were taxed on a reverse charge basis and reduced due to amendments made in Table 5 or Table 7 of the GSTR-4. This value must exclude the net value of credit notes. 14. Differential tax paid on account of declaration made in 10, 11, 12 & 13 above - In this section, you are required to mention how much tax you must pay and how much you have paid so far per the declaration made in fields 10 to 13 of this form. The tax value must be split into integrated tax, central tax, state/union territory tax, cess, and interest. In this part, mention details related to all refunds claimed, issued, pending, sanctioned, and rejected; credits availed or reversed; and late fees owed during the financial year. Break down each value according to the type of tax levied on the transaction: central tax, state tax/union territory tax, integrated tax, cess, interest, penalty, and late fees. 15 A. Total refund claimed - Enter the total value of all the refund claims filed during the financial year, inclusive of refunds that were sanctioned or rejected or are still pending. 15 B. Total refund sanctioned - Enter the total value of all the refunds that were sanctioned. 15 C. Total refund rejected - Enter the total value of all the refunds that were rejected during the financial year. 15 D. Total refund pending - Enter the total value of all refund applications for which acknowledgement has been received and which are being processed, excluding provisional refunds received. 15 E. Total demand of taxes - Enter the total value of tax demands for which order confirmation has been received from the authority. 15 F. Total taxes paid in respect of E above - Enter the total value of taxes paid out of the total value entered in field 15E. 15 G. Total demands pending out of E above - Enter the total value of demands that haven’t been recovered, out of the total value entered in field 15E. 16 A. Credit reversed on opting in the composition scheme (-) - Enter the total value of all credits reversed when paying tax under the composition scheme. You can use the details given in Form ITC-03 to fill in this information. 16 B. Credit availed on opting out of the composition scheme (+) - Enter the total value of all credits availed when you opt out of the composition scheme. You can use the details filled in FORM ITC-01 to fill in this information. 17. Late fee payable and paid - If your annual return is filed after the due date, you will need to pay a late fee. Enter the total late fee due and the amount paid so far, if applicable. Before filing the GSTR-9A, you must sign and authenticate the return either through a digital signature certificate (DSC) or by using an Aadhar-based signature verification mechanism.